Parties are great fun, but for the host, they can also be quite stressful. Feeding everyone can be a bit of a headache. There is a lot of work involved both before your event or party, as well as on the day. Fortunately, Hog Roast Dundee is here to take the strain. We can take care of absolutely everything, enabling you to relax and enjoy the company of your guests. At Hog Roast Dundee our team of professional chefs work with local butchers and suppliers to provide you with the best possible food. As well as whole hog roasts we offer a range of other meats. Your guests will enjoy eating succulent spit roasted turkey, lamb, beef, chickens or suckling pigs just as much as they would a hog roast. They all taste great whether they are served simply in soft rolls with a tasty sauce and stuffing or as part of a help yourself carvery style buffet. People love our canapés, salads, side dishes and desserts just as much as they do our spit roasted meats. So, if you want you can just as easily put together a traditional buffet spread for everyone to enjoy. Our team will just as happily serve your guests at the table if that is what you want. 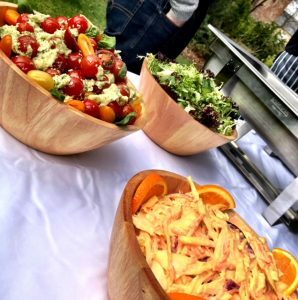 Over the years, we have catered for huge weddings and corporate events and provided a full front of house staff as well as a waiting team. No event is too big or too small for us. We adjust the way we work to fit in with what you want.